So when you first start chasing after that zero waste lifestyle (good for you! ), you might notice that there are a LOT of options and choices to make. It can be kind of overwhelming. But I’m here to make everything easier! 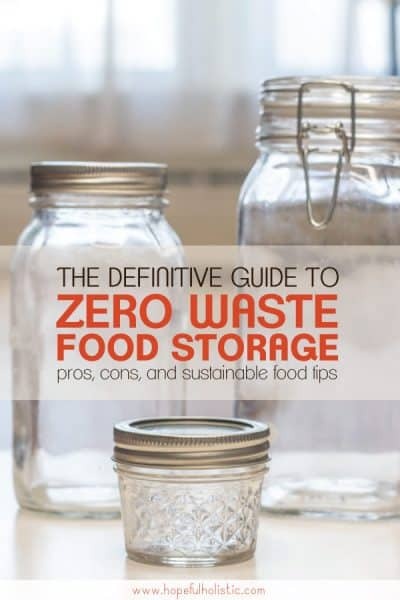 Well, I’ll at least guide you through the zero waste food storage part. In my zero waste journey, food storage is one place where I had a lot of waste, and where I had the most problems choosing truly sustainable options that would last me for a long time. I bought some things that didn’t work great. I wish I had had a guide back then to help me navigate all the options for zero waste food storage! That’s where the inspiration for this post came from. If you want to take the guesswork out of how you can store food without using as much plastic or disposables, you’ve come to the right place! I’ve put together all of the options I’ve tested out (so far) for zero waste food packaging, and I have a little description of how to use each option, along with the pros and cons of each type of container or packaging. I’m going to try to help you see how zero waste food packaging can be simple, eco-friendly, and affordable! This website contains affiliate links. More info here. As you probably know, we all need food to survive. It’s not a need that’s going away any time soon. So, any waste we make from food will be ongoing, making this a waste issue that’s worth solving. Food waste can come from old or unused food or food scraps. Food breaks down pretty easily, however, and pretty much anything other than animals products can be composted. The bigger problem is the packaging the food comes in. This can include plastic, styrofoam, aluminum foil, and more plastic. These things don’t break down, but they do pollute our rivers and oceans. It usually doesn’t get recycled, but even when you do recycle plastic, it can only be done once before it’s committed to the landfill. But even before it’s thrown out, plastic food storage is touching our food. This means it’s leaching into the food you’re eating -especially if you heat it up in plastic- and allowing toxins straight into your body. It seems just so much easier to eat something messy when you can throw away the container. You save time and energy by not washing it, right? The problem with this is that disposables -things we throw away- don’t just go “away”. They go somewhere, and they become someone else’s problem. They end up in landfills, where they off-gas dangerous chemicals or eventually end up in the ocean, where they kill sea life and pollute the whole planet. And a problem for the whole planet is a problem for you, too. So it’s worth it to be a part of the solution– even if that means spending a couple extra minutes washing and reusing a food container. The good news is that there are a bunch of great zero waste food storage options that aren’t toxic to our earth or our bodies! Before going out to buy every type of pretty zero waste packages there are, take a look at this list and see if you can find something that will be helpful and sustainable for you to add to your collection. I’ve put this list roughly in order of my favorite to my less-favorites. None of them are bad options, but there are a couple of things you might want to know about some of the products on here before you decide what to buy. But first- do you even need to buy new stuff? It can be tempting to get shiny new things that make you feel good about how sustainable you are. But there are some things you should wait to buy until later into your zero waste journey. For more on this topic, check out my post on zero waste products to avoid. But for now, just look through what you already have in your cabinets! Sure, stainless steel tins look nice, but if you have loads of unused mason jars, you don’t really have much of a need for more storage, do you? There are also options at the bottom of this list for zero waste storage options that you can use in a pinch, most of which are probably already somewhere in your house! Think about new purchases instead of just jumping into it. After all, the entire zero waste movement starts with refusing and reducing… prioritize those things. Still, there are times when new stuff is necessary for the health of you and the earth. For example, if all you have is plastic Tupperware, you might want to find another use for those containers. No one needs those toxins touching their food. You should especially be on the lookout for old plastic Tupperware that looks kind of frayed on the edges- that means it’s breaking down, and probably leaching even more toxins than normal. Use them for holding nails, craft supplies, or other non-food items instead. Or just recycle them! There are many other reasons you might want to upgrade to zero waste food storage too. So without further ado, here are my picks for some great low waste options for storing your food! 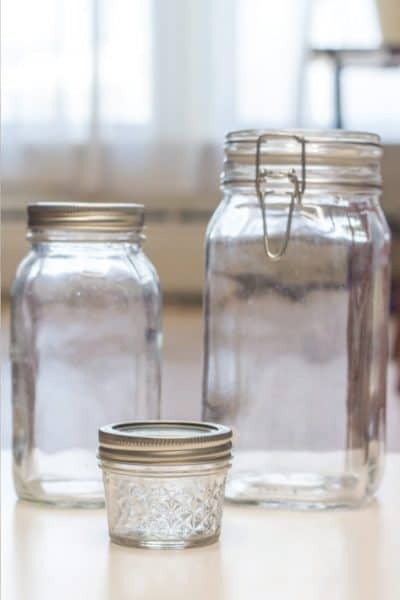 Glass jars are one of my tops suggestions for zero waste food storage. And if you don’t want to scavenge mason jars from a thrift store, the good news is that they’re pretty inexpensive to buy online too! Amazon has plenty of 4oz, 8oz, pint, quart, and half-gallon mason jars to fit everything you need to store. I also really enjoy using hinged flip-top glass jars. There’s no lid to lose with these jars, plus they look pretty in the pantry! I make sure to bring plenty of jars of every size with me when I go bulk shopping! That’s pretty much it… Mason jars are awesome! Another one of my go-to staples for bulk store shopping or trips to the farmer’s market is cotton bags. These zero waste food bags can hold produce or pretty much any dried ingredient that’s bigger than a flour, including beans, quinoa, rice, pasta, bread, and more. Just don’t put anything wet into it, obviously. And cotton bulk bags aren’t air-tight, so they aren’t a great option for things like cheese. See the next tip for a better option for storing cheese in the fridge! 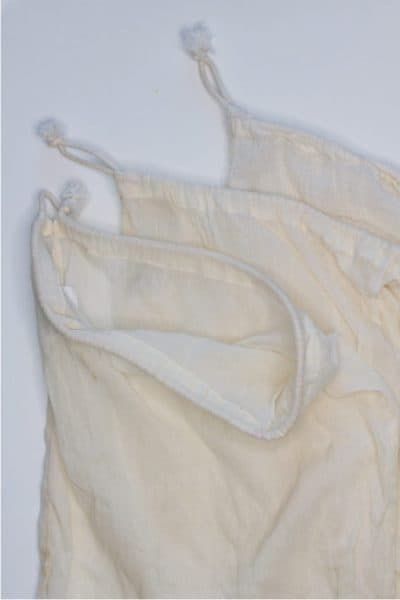 Cotton bags are a great option to replace the flimsy plastic bag that’s available in most grocery stores’ produce sections. You can find netted mesh bags for produce, or cotton bags for everything else. There are also eco-friendly fabric bowl covers that work like clingwrap. It might take a little bit of time to get used to putting food into fabric packaging, but it’s sanitary as long as it’s clean! Cotton bags are also super light and easy to stuff into your luggage if you want to cut down on waste while you’re traveling! 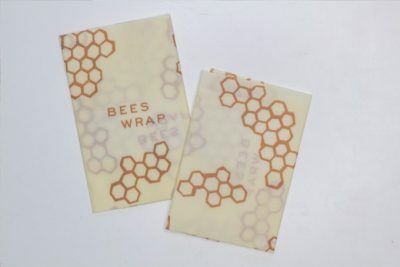 Bees wrap is an eco-friendly, zero waste solution to plastic wrap. Ceran wrap doesn’t break down, and it’s single use, meaning a lot of it ends up in landfills and our oceans. Plastic wrap isn’t good news for the environment! Beeswax wraps are a much better option. They come in a variety of sizes and can fit everything from jars to casserole dishes and loaves of bread. Bees wrap is how I store cheese in the fridge– just wrap it tightly and you’re good to go! They’re very sanitary and washable, and a fantastic option for storing leftovers! Just make sure not to scrub too hard or use any heat when you wash them since this can thin the waterproof coating of beeswax and resin. Because of this, it’s best not to let your beeswax wraps directly contact messy food- getting the food off might reduce the lifespan of your bees wraps. When I first started trying to use less plastic for my health, replacing my Tupperware with glass containers was one of the first places I started. Sure, these Pyrex containers have plastic lids, but they usually don’t touch the food so I don’t feel like it’s as big of an issue. They can break eventually, but if they do, just use bees wrap instead! (They sell extra lids separately too if you’d rather have an air-tight option). 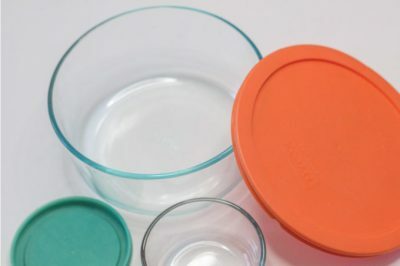 One of my favorite things about Pyrex containers is that there are only a few different sizes for each lid shape, and the lids are color coordinated. Gone are the days of digging through the endless Tupperware to find the right lid for the right container! Low-waste glass containers are a breeze to clean, inexpensive, and useful for pretty much any soup/leftover/food you can think of. Hubs packs his lunches in these every day. Stainless steel is kind of the poster child for the sustainable movement. It looks pretty, it’s durable, and it lasts forever. One bad thing is that they’re a tad expensive. And I’m not sure if you would want to heat these in a toaster oven (I don’t) but definitely don’t microwave them! Since it isn’t glass or stoneware it can be hard to use for anything other than cold foods- sandwiches, fruit, veggies, and the like. Stainless steel tins also work well as freezer containers. They’re good for fridge and freezer storage since they stack nicely and aren’t super hefty. And one of my favorite uses for stainless steel containers- they’re a great option for packing lunches and snacks! 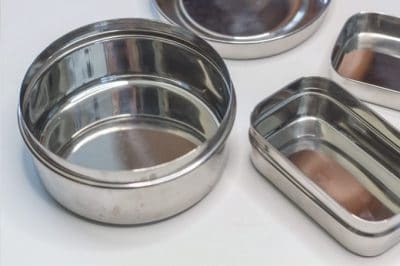 I bought these stainless steel tins, and they’re leak-proof and work great. These are stretchy rubbery lids that are made to go over round glass containers or bowls. The ones I have are handy, yeah, but I’ve had a couple break along the sides over time. They definitely aren’t as durable as something like glass or stainless steel. So don’t stretch them too far! Fabric bowl covers are a little more elastic, but they aren’t watertight. I’ve also just put my round silicone lids around something rectangular, like a bread pan, and used a rubber band to secure it for the fridge or freezer. If you’re going to buy these, I’d recommend checking to see if the sizes are ones that will fit the containers you want to use them for. If you have a bunch of glass containers that are 8 inches wide, and you buy silicone lids that are 7 inches wide, chances are they won’t fit. You’ll need to find a different container that they do fit, or you won’t have any use for them at all. You don’t have to buy loads of brand-new products to store your food without any waste! 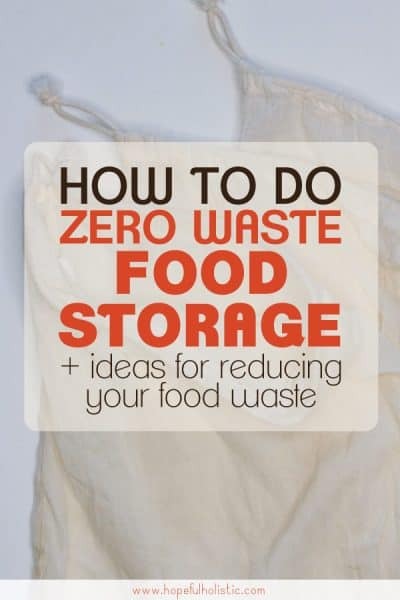 There are a couple other simple options for zero waste food storage that I’d like to mention. For example, if you have a bowl of leftovers, just put a plate over it in the fridge! Or if you have some baked goods out on the counter, you can just cover them with a piece of parchment paper (use it for baking later) or a hand towel! Plastic-free food storage doesn’t have to be complicated. Get creative with what you already have lying around- you might be surprised at what you can already do to cut down on food packaging waste without buying anything brand new! There are probably some reusable food storage containers in your kitchen already. One problem is that these items aren’t see-through (unless you use something like a clear glass plate) so you might forget what you have in the fridge. It’s happened to me. You probably already have these! I hope these tips for sustainable and reusable food storage packaging and containers are helpful to you! Whether you choose to go with silicone stretch lids, stainless steel freezer containers, mason jars, or other low waste food storage, you can use these tips to continue to grow and keep learning about how to do simple, eco-friendly, zero waste food packaging. We aren’t going to stop eating any time soon, so there’s no better place to start becoming more low-waste and plastic-free!